A poor fisherman found what is thought to be the world’s largest pearl, but hid it under his bed for a decade without knowing its worth. 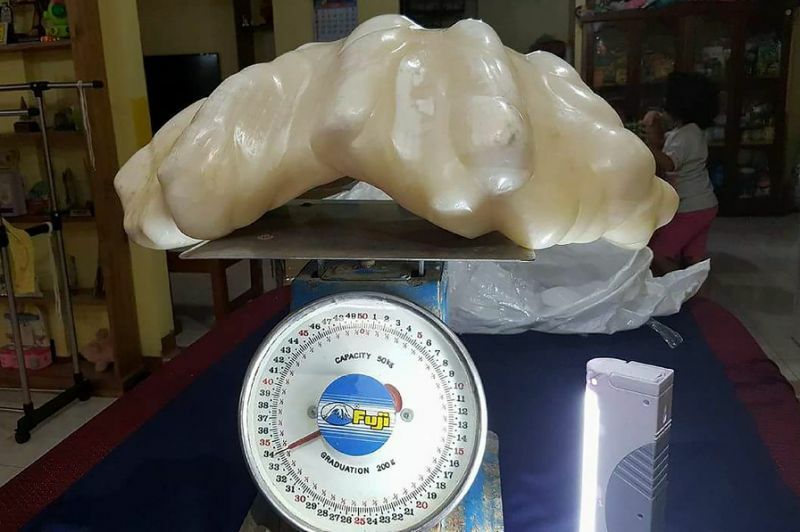 The man found the 75-pound pearl inside a giant clam that was snagged by his anchor as he waited out a storm at sea, according to local tourism department chief Cynthia Amurao, who is also his aunt. Not knowing it could be worth tens of millions of dollars, he kept the 12-inch by 24-inch pearl in his thatch hut on the western island of Palawan, tucked under a wooden bed as a good-luck charm, Amurao added. In July, the nephew moved to a new address and took the object to his aunt in a tricycle, asking her to hide it for him, said Amurao, the city tourism officer for Puerto Princesa, the provincial capital. “I was awestruck when I saw it just sitting on the dinner table,” Amurao said. He described the fisherman as a member of the tiny Cuyonon ethno-linguistic group who live in a few small islands off Palawan, the biggest island in the southwest of the Philippines surrounded by the South China Sea and the Sulu Sea. “I told him it would be pointless to hide it as we do not know its value. Why don’t we put it on public display instead,” she said. Local officials are hoping gemmologists will visit the city to assess its quality and value. The 14-kilogramme “Pearl of Allah“, also known as the “Pearl of Lao Tzu”, is often referred to as the world’s largest. It was also found off Palawan, in the 1930s, and has been appraised by gemmologists at tens of millions of dollars. Puerto Princesa city information officer Richard Ligad confirmed Amurao’s account and said the man who found it could be in for a massive change in his life’s fortunes. “He has not signed any deed of donation (to the city) so it remains his property,” Ligad said.